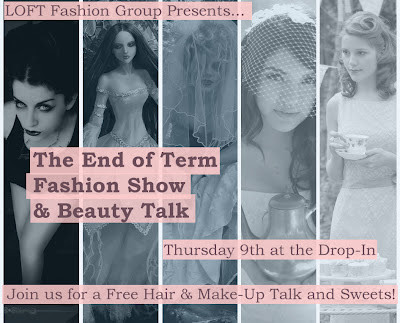 This Thursday, a youth fashion group that I have volunteered with will draw to a close. The final meeting is set to consist of a hair and make-up talk and pile of free sweets, along with the participants customised outfits on display. Below is the poster I made to advertise the event on Facebook. Two of the themes that were given to help inspire the members were 'The Gothic Fairytale' and 'Crashing the Tea Party', and tried to I incorporated both of these elements in my poster.